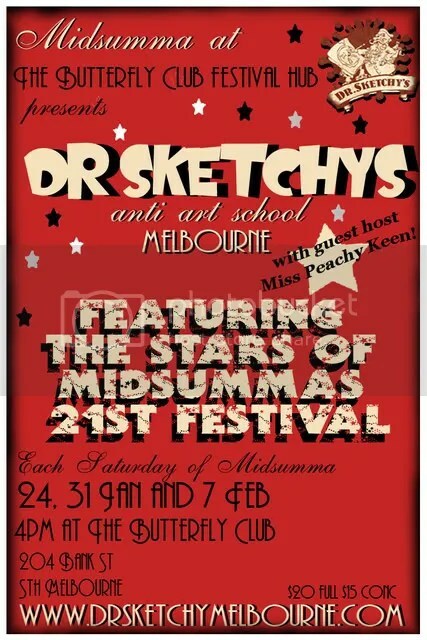 Midsumma’s 21st Festival on stage. Come along and sketch them each Saturday of the festival. Please note: Our Midsumma models will be announced on Sunday 18 January, Midsumma’s 21st festival kick off! Dr Sketchy’s is what happens when cabaret meets art school. The perfect antidote for boring, typical art classes. Bringing fun, excitement and a bit of cheek back to life drawing with kooky contests and bodacious burlesque beauties. We don’t mind if you draw for your supper or just for fun, we are happy to have you! So forget your easels and messy mediums, just bring a sketch pad and your pencils! Founded in 2005 by artist Molly Crabapple, with branches located in 60 cities and spanning all continents across the globe! Dr Sketchy’s Melbourne at The Butterfly Club is the second longest running branch in the world, pipped only by Dr Sketchy HQ in New York and has hosted the likes of The Town Bikes, Hi Ball Burlesque, Sarah Lea Cheesecake, Mama Lou: American Strong Woman and more since July 2006.